Mount Soma provides various accommodations for those who want to take advantage of its beauty and power for more than a day. It is an opportunity to stay at a spiritual retreat center, alive with the Transcendent, near Maha Nandi and the powerful vibrations of Sri Somesvara Temple. All Mount Soma accommodations are built according to Vastu architecture and are walking distance to Sri Somesvara Temple, the Visitor Center/meditation hall, Maha Nandi, and the soon to be Hanuman Park. Delicious, vegetarian meals are served three times a day and group meditation is offered at least twice a day. To make the most of your trip, please check the Schedule of Events to coordinate it with the different activities offered at the Temple and Visitor Center. The Student Union has a large deck to relax and enjoy the sunrise or the gorgeous mountain views any time of day. Meals are served in the dining area and the fireplace is a wonderful place to congregate. 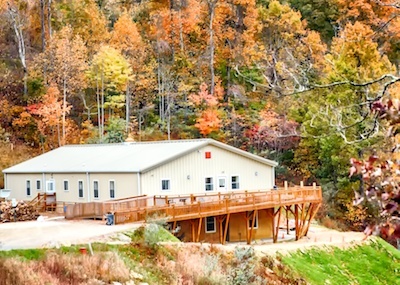 Please call 828-476-4073 or email reservations@mountsoma.org if you have any questions or wish to make reservations. Please note: It is not possible to include all information on this website. Therefore, we suggest guests clarify information when communicating with the reservations department.